A lot of ultra-rich people are quietly preparing to “bug out” when the time comes. They are buying survival properties, they are buying farms in far away countries and they are buying deep underground bunkers. In fact, a prominent insider at the World Economic Forum in Davos, Switzerland says that “very powerful people are telling us they’re scared” and he shocked his audience when he revealed that he knows “hedge fund managers all over the world who are buying airstrips and farms in places like New Zealand”. So what do they know? Why are so many of the super wealthy suddenly preparing bug out locations? When the elite of the world start preparing for doomsday, that is a very troubling sign. And right now the elite appear to be quietly preparing for disaster like never before. RELATED: It Will Happen This Month, September 2015! Here’s Why Everyone Is Storing Food And Supplies! The insider that I mentioned above is named Robert Johnson. He is the president of the Institute of New Economic Thinking, and what he recently told a packed audience in Davos is making headlines all over the planet… With growing inequality and the civil unrest from Ferguson and the Occupy protests fresh in people’s mind, the world’s super rich are already preparing for the consequences. At a packed session in Davos, former hedge fund director Robert Johnson revealed that worried hedge fund managers were already planning their escapes. “I know hedge fund managers all over the world who are buying airstrips and farms in places like New Zealand because they think they need a getaway,” he said. Of course not all elitists are planning to jet off to the other side of the globe. go deep underground when things hit the fan. The so-called Survival Condo complex boasts full and half-floor units that cost $1.5 million to $3 million each. The building can accommodate up to 75 people, and buyers include doctors, scientists and entrepreneurs, says developer Larry Hall. As former nuclear missile sites built under the supervision of the Army Corps of Engineers, the structures were originally designed to withstand a direct hit by a nuclear bomb. At ground level, they can be sealed up by two armored doors weighing 16,000 pounds each. sophisticated water and air-treatment facilities, state-of-the-art computer network technology and several alternate power generation capabilities. Anger and frustration are rising to unprecedented levels. And they can see that things are likely to boil over once the next major economic crisis strikes. We live at a time when almost everyone is getting poorer except for the elite. The top 1 percent now have close to 50 percent of the wealth in the entire world, and each year wealth becomes even more concentrated in their hands. And we got a few clues about what things might look like what that time comes from the recent “snow scare” in New York. Frightened consumers wiped out supplies of bread, milk and eggs within just a few hours. People started to take advantage of one another, even the journalists seemed like they were on the verge of panic, and virtually the entire city shut down. 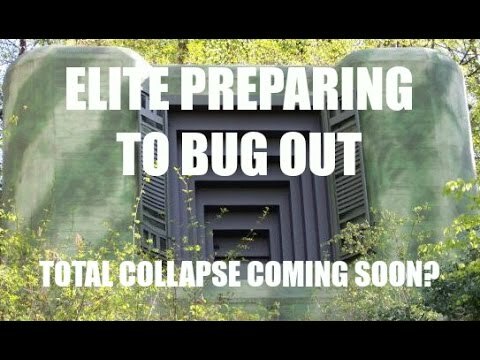 If the elite are preparing to bug out, it is hard to blame them. Life is about to dramatically change, and signs of the coming storm are everywhere. I hope that you are getting prepared for what is about to hit us while you still can. Enjoy!!! There really isn’t a point to bugging out, whether forced or not, as any scenario involving the kind of disruption to society you’re describing all leads to the same result. When society breaks down, we won’t be able to take care of the 440+ nuclear reactors around the planet. Within about a month at the longest, they’ll start to pop. Plutonium exists on only one planet in the solar system. Unfortunately it’s on the only planet in the solar system currently capable of supporting human life. When those reactors start popping, there won’t be ANY complex life left on the planet.